Drinking filtered water from water bottles is a safe way to avoid tap water, and when you are able to clean the water bottles properly, you can re-use them instead of throwing them away. Vinegar is a natural cleaning, disinfecting and deodorizing agent that works perfectly for cleaning water bottles, as it is natural and contains no toxic ingredients. Fill the water bottle with hot water and vinegar, pouring 1 tsp. vinegar into the bottle per 1 qt. of water. Twist the lid onto the water bottle, and shake to rinse the walls of the bottle with the vinegar solution. 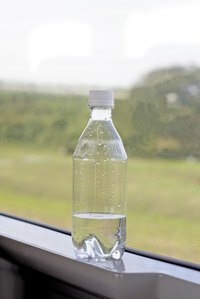 Let the water stand in the bottle for 10 minutes. Saturate the edge of a cleaning cloth with the vinegar mixture, and wipe the lip of the water bottle. Discard the water, rinse the bottle with fresh hot water and allow to air dry.